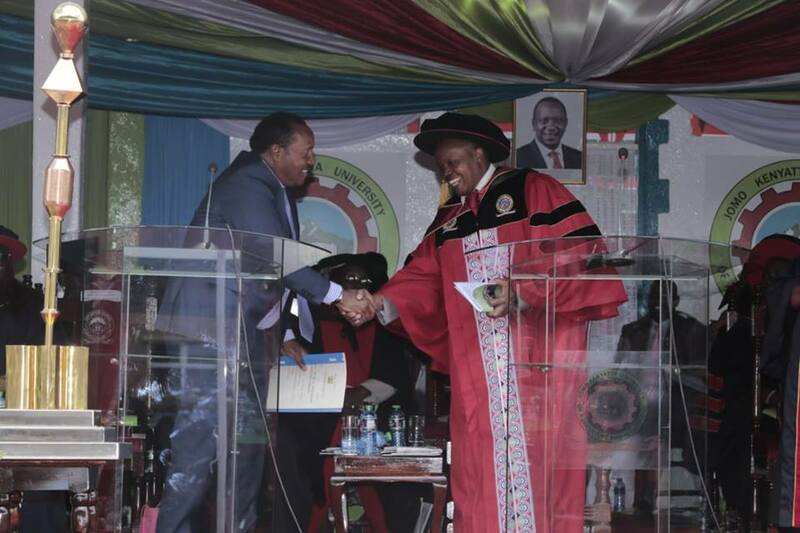 Home EDUCATION Governor Ferdinand Waititu's speech during JKUAT 32nd Graduation Ceremony. Governor Ferdinand Waititu's speech during JKUAT 32nd Graduation Ceremony. I take this opportunity to welcome the new Chancellor JKUAT and Professor Victoria Ngumi the new Vice Chancellor JKUAT. The county government appreciates the role JKUAT plays towards the livelihoods of the great people of Kenya and more so to the residents of Kiambu County given its location. The county Government will give you unwavering support in areas within its mandate. Education is a driver for the big four agenda. The County Government in recognizing the need to support skills development, has greatly improved vocational training centres and has worked hard to increase the same from 33 centres to the current 40 centres. These centres are training personnel in various disciplines that feed into technical learning institutions and ultimately to University raising the enrollment. Therefore, I am calling on JKUAT to partner with the County government to develop courses that will equip these graduates with skills that are relevant to the global market needs. JKUAT’s contribution to the improvement of infrastructure in Juja and its environs has inspired the County Government to come up with a modern market facility to boost food security and hygiene to avoid communicable diseases. The road between Juja and Gatundu is also under construction to ensure accessibility to Gatundu level 4 hospital by the members of the community and JKUAT students from the College of Health Sciences and other sectors of the university. My Government is also working towards piping water from Karemenu dam for the university use and for the homes around. This will ease the perennial water shortage as the University may no longer rely on Ndarugo River which at times can be seasonal. Construction of the sewer system is almost complete and the university will shortly be connected. This will redeem the University plot near the highway which can be used for other purposes like research and academic development. JKUAT is a Hub in ICT thus the County Government is calling upon the University to find ways to collaborate with it in the development of ICT solutions especially in the improvement of service delivery. My government is currently rehabilitating a big number of alcohol and drug abuse victims who are responding well and are currently undergoing training courses in our vocational centers in order to equip them with life skills and technical courses that will improve their livelihood and create positive attitude towards life in general. We call upon our students to restrain from this cancerous vice that has degraded lives of many gifted individuals leaving them hopeless and in severe cases costing their lives.